While the rise and expansion of social media has led to our society being more connected than ever, it has also paved the way for some extremely stupid and sometimes even dangerous behaviour by attention-hungry morons. YouTube is filled with videos of people doing stuff so dumb that not even the Jackass crew would consider it practical, and all because they’re obsessed with becoming the next viral sensation. It is such a problem that you could introduce any kind of dangerous interactive stunt program in fictional realms such as film and it would actually come off as being disturbingly logical. This is where Nerve comes in; an adaptation of the satirical novel by Jeanne Ryan, and directed by Catfish duo Henry Joost and Ariel Schulman, it takes the idea of people doing the craziest things for internet fame and fortune, and turns it into a thrilling, sometimes provocative, but most of all fun adventure film in the age of Pokémon Go. 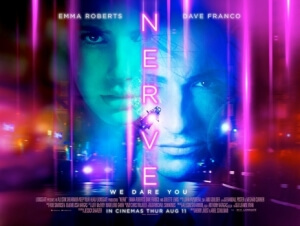 The heroine of this story, high school student Vee (Emma Roberts), who is goaded by her friend Sydney (Emily Meade) into signing up for an underground online gaming website called Nerve, wherein watchers can introduce dares of any kind that a player must then enact in exchange for money prizes. Identifying herself as a player, she quickly teams up with another dare-taker known as Ian (Dave Franco) and together they go around New York City doing the crazy things that watchers are daring them to do. However, when it soon becomes apparent that the game is getting too dangerous, things suddenly take a turn for the worse, and both Vee and Ian must now play to survive. Obviously, there’s a ton of social commentary within this concept, particularly regarding this new generation’s unhealthy reliance and addiction to social media, as well as the online gaming community as a whole, and if it were to be as ham-fisted as the commentary in, say, The Purge then it probably wouldn’t have been as fun to watch. However, while that aspect of the concept certainly factors into a lot of the film’s subtext, the film isn’t a pretentious examination into this depraved culture; Joost and Schulman are aware that it is a rather goofy concept, up to a point anyway, and have as much fun with it as possible by injecting a lot of life into these scenes, through quick-paced editing and humorous scenarios such as getting a tattoo or running out of a store half-naked that are made funnier thanks to the sheer commitment and likability of its leads. Roberts and Franco have great chemistry with each other, and their energy that goes into selling even the most intense of sequences – more than once, characters do indeed find themselves hanging on for dear life miles above ground – makes it all the more compelling and, dare we say it, nerve-racking. It is a fun adventure movie at its core, albeit one with a more sinister edge as the film reaches its eventual climax, one that the iPhone generation can really get behind as well as older and slightly more cynical viewers who might be surprised at just how entertaining it can be. It isn’t perfect, with some but not all of the cinematography being a little jarring to fully grasp – there are lots of POV shots from camera lenses of phones to an Unfriended-style prologue and epilogue consisting of a person’s desktop – and one of the final reveals during the closing moments is perhaps one twist too many, but it’s far more fun than it has any right to be, even with a concept that doesn’t always make sense and might be a bit too goofy for its own good. But hey, if the entire world can suddenly become obsessed with trying to catch as many Bulbasaurs or Charmanders as they can by simply just walking around with their eyes glued to a phone screen, then why couldn’t something like Nerve exist in this universe and become an instant pop culture sensation? Maybe that’s why the film briefly experienced a mini-boost in exposure when the trailers first debuted, because we as a society are so obsessed with finding the next big thing in social media that even the trailer for a film about the next big thing in social media gets an unhealthy amount of attention. Well, at least it beats planking. Nerve is a thrilling, provocative, and most importantly fun adventure movie in the age of Pokémon Go, where the initial concept which has a disturbingly firm footing in reality is treated with a sense of enjoyment while not being fully afraid to address its more obvious social commentary.